School Climate and Safety have become hot topics in education. Along with helping students pass end of course and state assessments, educators now have to face the daily reminder that school safety is a top priority with the growing number of school shootings across the United States. Schools are investing large amounts of money on security measures, training, and school resource officers to ensure that our students are safe and feel secure in what should be a positive place for them to learn each day. As schools ramp up their efforts to create safe schools, it is easy to forget that the number one ingredient to create safe schools is to get laser-focused on creating a strong system of universal supports. Response to Intervention (RTI) is a multi-tier approach to supporting students both academically and behaviorally. Tier 1 of this model is considered the key component of tiered instruction and represents the base and what we are doing for all students universally. Usually a school with a strong Tier 1 behavior support system has an intentional system of supports happening from the school-to-student level, which would be things like explicitly taught positive behavior expectations and ways to recognize students for behaving in those positive ways. Catch them doing good instead of always making sure they don’t do wrong! A school with a strong Tier 1 would also have a strong system of support in place from the staff-to-student level - things like a strong focus on training staff on proactive classroom management, intentional relational strategies, and having a school-wide focus on implementing, with fidelity, key messaging and curricula. These are examples of simple (but not always easy!) components that begin to build the foundation for safer school climate and culture. Sometimes this work feels like another thing on our plate, but at CharacterStrong, we believe THIS IS THE PLATE! If we recognize that this relational work is the foundation of safety, how can we get even more intentional with our tools, systems, and strategies to build these critical relationships? Not just school-to-student and staff-to-student approaches, but what if we also strengthened the student-to-student, students-to-staff, and student-to-community focus in schools? Instead of just focusing on how we can better react to things that might happen at school, what if we could get proactive to truly create safer schools? To do this, we would have to go to work as a staff to build a strong foundation - a rock solid plate - upon which we do all of our other incredible work. We have developed a 40 Week Staff CharacterDare that provides practical strategies over the course of your year. We know that when we get busy, the abstract relational and culture-building work sometimes unintentionally falls to the bottom of the to-do list! At CharacterStrong, we like to say, “We need to be reminded more than we need to be taught!” So, our CharacterDare is a simple, weekly reminder to keep a disciplined focus on cultivating a culture of character, compassion, and relationships. Along with the staff CharacterDare we have infused into our advisory curriculum student CharacterDares that start each lesson. We believe that students want to do good, they just don’t always know what good looks like. The CharacterDare process meets students right where they are at by providing examples of what strong character looks like each week and dares them to do it. They are not graded on this, they are just asked to face the challenge. Upon returning to the weekly lesson, students start the class with the question, “Truth or Dare?” This process gives every student a voice. If a student did not do the dare they choose “Truth” and share what they think about that CharacterDare. If a student did attempt to do the week’s CharacterDare then they would choose “Dare” and share something they learned about themselves or others in attempting the dare. Following the dare process students would have a lesson on either a character development topic like active listening or a social emotional learning topic like empathy. 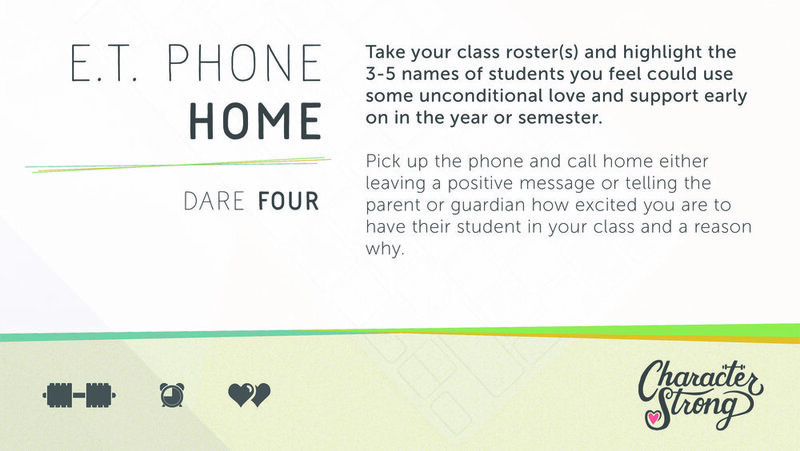 Many of these dares and lessons provide students opportunities as well as challenges to connect more intentionally with their peers and staff in the school or even family members and or friends. We call it a True Tier One. Here are a few of our favorite strategies to create an intentional culture of connection and, in doing so, create safer schools. Hand each student a notecard and ask them to write down their name and one thing that they could teach you. Use your new-found knowledge intentionally by asking students about what they put on the card, especially with students whom it has been harder to connect with in a positive way. 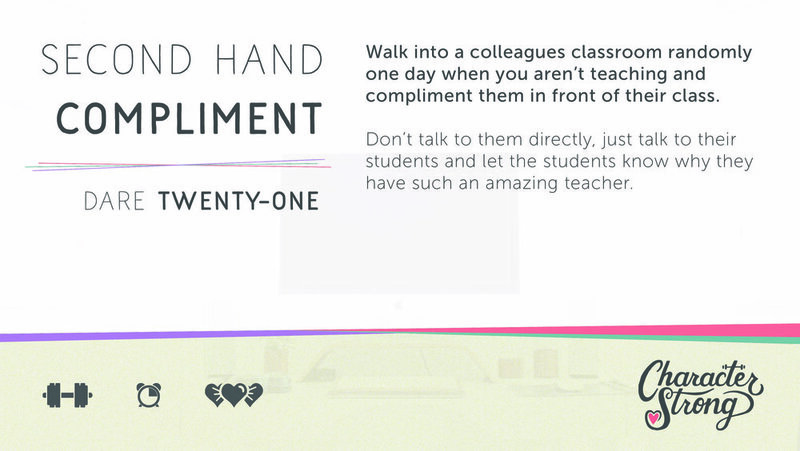 Walk into a colleagues classroom randomly (or intentionally) one day when you aren’t teaching and compliment them in front of their class. Don’t talk to them directly, just talk to their students and let the students know why they have such an amazing educator. Remember that a basic human need that all people have is to be paid attention to and appreciated. We can never go wrong in this area! How powerful is it to brag about your colleague in front of their students? Make it genuine, make it quick, but know that you are not only possibly making someone’s day, but you are also role modeling for students what it looks like to identify good in someone else and have the skill, courage, and vulnerability to tell them about it. Our Advisory curriculum is designed to be a practical, easy-to-use system to build the social-emotional skills and character traits we want in safe schools. Our lessons span grades 6-12 in a vertically-aligned scope and sequence of over 200 lessons. Combining social emotional learning and character development is critical for engaging instruction at the secondary level and we have seen schools around the country use our Advisory program as the foundation for a True Tier One approach. Why? It creates a common language for staff and students, builds their emotional capacity for community and connection in schools, and gives a space where staff-to-student, student-to-student, student-to-staff, and student-to-community strategies can start to come to life! If we want safer schools, we must first focus on the plate itself - the relationships in every building that define that building’s climate and culture. When we intentionally build connection, character, and trust, we are setting the stage for emotional and physical safety. When we teach not only academics, but the Whole Child, we are helping to create capable, compassionate young people. Let’s continue to do that incredible and purposeful work, together. About the Author: John is a co-founder of CharacterStrong, a Servant Leadership trainer, and motivational speaker. He was Washington Advisor of the Year, taught 5 leadership classes per semester for 10 years at Sumner High School, and was a Program Administrator for the Whole Child for five years.